Coconut milk is a great alternative for those who follow a ketogenic & paleo diet and avoid dairy. It&apos;s high in fat, low in carbs and won&apos;t kick you out of ketosis. Also, just like coconut oil, it contains fat-burning MCTs. Provided you stick with your macros, coconut oil will help you burn body fat for fuel. 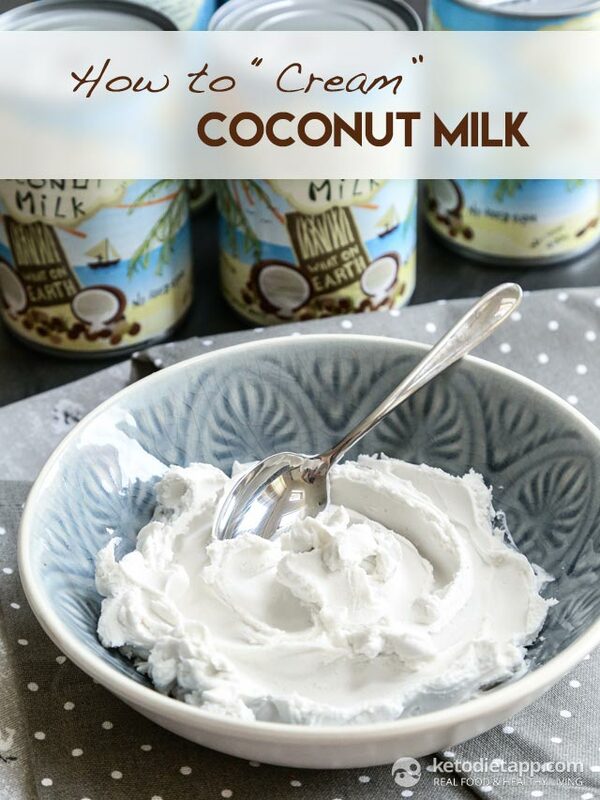 "Creamed" coconut milk is sometimes confused with creamed coconut which is essentially coconut butter, also known as coconut mana and it&apos;s made from dehydrated coconut meat. Make sure you don&apos;t confuse the two when following my recipes. What is Creamed Coconut Milk Used For? You can use "creamed" coconut milk just like dairy cream, cream cheese, yogurt or mascarpone. It can be used in both sweet and savoury recipes: for thickening sauces, making fat bombs or as frosting on low-carb cupcakes and pies. Additionally, you can make keto chocolate mousse with it or simply eat with some berries on top. 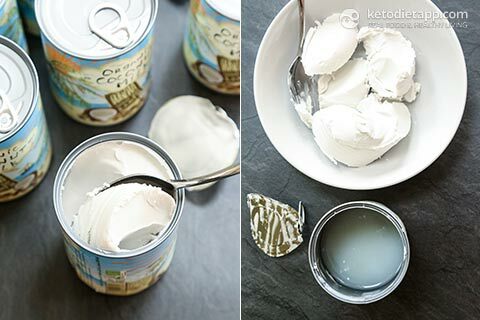 If you like yogurt, try making dairy-free yogurt from creamed coconut milk by using this technique, just use creamed coconut milk instead of regular coconut milk. There are two main types of coconut milk. Some products remain liquid while others "cream" when refrigerated. Products that remain liquid and don&apos;t thicken are not suitable for making "creamed" coconut milk. The reason they "cream" is because they contain thickeners. Guar gum is the most common thickener used in coconut milk. It gives some aftertaste but that can be masked using ingredients such as cinnamon, vanilla or cacao powder. If you find a product without thickeners, chances are it won&apos;t work for "creaming" so keep that in mind. This coconut milk will cream and is also BPA-free. An example of coconut milk that doesn&apos;t "cream" is Aroy-D. It tastes just like homemade coconut milk without additives and it&apos;s BPA-free. You can use Aroy-D to make Low-carb Cappuccino. To summarise, to "cream" coconut milk, you have to use coconut milk that contains thickeners and creams when refrigerated. Place a can of coconut milk into the fridge overnight. Don’t shake the can before opening. It should get very thick and the solids should separate from water. If it doesn’t, you need to try another brand. I recommend Thai Kitchen Organic or Native Forest or any other brand that works well for you. I used "What On Earth Organic Coconut Milk" when I made this recipe. 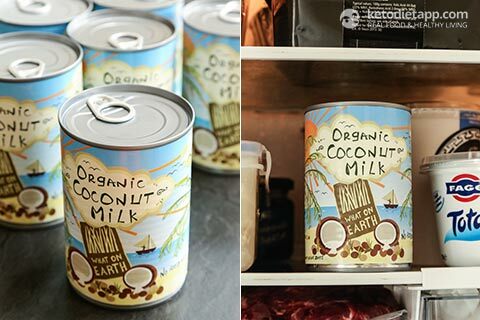 It&apos;s the best canned coconut milk I&apos;ve tried in the UK. However, last time I checked, this brand was unavailable and I&apos;m not sure if/ when it will be available again. Once thick, transfer to a bowl (without the water!) and mix with a spoon, whisk or a blender. The extracted cream can be used immediately or stored in the fridge for up to 3 days. There aren't enough superlatives to describe your blog and recipes. I haven't lost weight but the health benefits have been well worth it, and I couldn't have gone this far without you. Thanks so much for the time and effort. The full-fat coconut milk I usually use does not contain any thickener, but if put in the fridge it get really hard on the top and the liquid part remains above...in fact I use it as a sort of deser by itself, or to cream teas and coffee. I have a lot of can of that at home: do you think it might work even if doesn't contain guar gum? Could I eventually "correct" it with a pinch of xanthan gum if it wouldn't cream anyway ? Oh that's brilliant! If you can find coconut milk without the thickener that gets thick and creamy, go for it. What I don't like about thickeners is the aftertaste. What is the brand you are using? Hi Martina. Please can you recommend a canned coconut milk for whipping into cream that is available in the UK. None of the products you recommend are available to order in the UK and I cannot seem to find one that will harden in the fridge and is whippable. Thanks for your blog and app. I use them all the time for information and recipes and they are fantastic! Thank you Helena! I really liked the one I used in this guide (the best taste and texture) but I can't find it anymore. Other than that I like is the Essential Waitrose Coconut milk and they also sell coconut cream that has even more solids and less water (smaller light blue cans). will it separate faster in the freezer? I wanted to add your Raspberry and Vanilla Smoothie from your Fat Bomb book to my SparkPeople recipes, so I added all the ingredients and came out with completely different numbers. Did I do something wrong? Note: I'm sorry but I had to remove the list of ingredients from your comment as this was a part of a recipe from my book (I have to follow the rules as outlined in my contract with the publisher). Thanks for this! I used a can of Conchita unsweetened coconut milk, which has just the milk and guar gum. I got the tip somewhere to turn it upside-down when putting it in the fridge, then when you turn it right-side up again you can empty the water if you don't want it and the cream is now all at the bottom of the can. Easy separation! The cream from this brand is very hard, but it's a great smoothie addition. Blended 50g of the cream this morning with some sugar-free chocolate syrup, almond milk, and almond extract - voila! "Almond Joy" shake! I am still curious what the nutrition info would be on just the cream. Like another commenter, I feel like removing the liquid probably affects the nutrition facts on the label. - coconut milk (1/2 cup): 3.2 g net carbs, 2.3 g protein, 24.1 g fat, 223 kcal. When I place the can of coconut milk in the refrigerator to cream, it separates but the cream is very hard and doesn't "cream" well. What am I doing wrong? I don't think you're doing anything wrong, it's just that some products are like that. The brand I used in this recipe was one of the best I've tried, but other products contain more fats (e.g. Biona coconut milk doesn't "cream" well). What you can do is to keep the separated cream at room temperature and then mix it when it softens slightly. Actually I prefer can coconut milk that is ONLY coconut and water. Then when refrigerated it separates, not really creams. Creaming something refers to blending it, like creaming butter and sugar for coookies. Coconut milk just separates, if you do NOT shake it up before you put it in the fridge! I know you're using words that you use in recipes, but you're confusing them with actual baking terms. For those of us who bake and cook, it could be disastrous. You don't need thinkeners in it for it to separate. If it's pure count and water it will, now it could actually take more like two or three days to separate. Which is why I typically keep about four cans in the fridge at all times. Even ones that are first pressing with thickeners sometimes take more than over night. I love your recipes, not trying to nit pick, just gets confusing when you change the meaning of words. I think you're right there, it is not actual "creaming" but I use this word because most people are familiar this term with regards to coconut milk. But it is "separation" rather than creaming  It is possible to "cream" / fluff up coconut milk too if you use an electric beater or an Isi creamer (in this case you need to use both the creamy part and the liquid part). If you like Aroy-D coconut milk, try their coconut cream. 100% cream, no additives. Pure and white and delicious. I agree, the best coconut milk & cream I've tried is from Aroy-D! Thanks for all you do! I've joined the current 60 Day Challenge and it's a grand experiment plus I'm having good results. I have a question about coconut cream. When I separate the cream from the water in the can, I use the cream for various recipes, and at first I didn't know what to do with the leftover water/liquid. But I discovered that I can use this for chia pudding and smoothies. However, I don't know the nutrition values of just the water by itself. I emailed the manufacturer of the coconut milk (in this case Thai Kitchen) and they couldn't tell me either. My thought is that most of the values are in the cream after separation, but that's just a guess. Do you know the macronutrients of the separated coconut milk -- each for the water/liquid and the cream? Hi Amy, I don't know what the nutrition facts are but I'd guess it's something similar to almond milk, which is almost fat-free with a small amount of carbs. I hope this helps! Added this to my baked granola parfait, It came out Par-fect! YOU are GOOD! This is super info and seriously, all the info I've read on your blog is super. Thanks for your diligence in bringing the best knowledge to us. Hi, is this the same as using coconut cream? Yes, creamed coconut milk is the same as coconut cream although fat content may vary depending on the brand. Thank you for not asking for money. So many web sites ask for money and so many of us cancer patients do have any money. I've already learned something from yours. I will buy one of your books when I have some money. Right now I need to get started on your free book. Thank you Lynn, I hope you like my ebook!